Am I too old for glittery eyeshadow? The other night, as I was heading to an Illinois Farm Family function, I told my girls that I wanted to put on more make-up before we left the house but I just hadn’t had time. I thought maybe a little eyeliner would have been nice; or some lipstick. But as usual, I was rushing to leave. I had taught preschool that morning, taken care of things around the house that afternoon, picked up the girls from school and helped with homework, and then it was time to go! Just as they always do, my daughters told me I didn’t even need make-up. They say that they can’t even tell the difference when I wear it, and that I’m pretty without it. Well, those deep dark circles under my eyes tell me something else, and I tend to listen to my blond eyelashes more than my own daughters. We need midnight black mascara! I’ve heard that past a certain age, you shouldn’t wear shiny eyeshadow because it highlights your wrinkles. I probably hit that age 5 years ago. Last Sunday at church, an older couple was sitting in front of us. During the sermon, their shoulders touched. Their heads leaned toward one another. I could imagine that when Ed and I aren’t separating two wiggly, giggly girls during the sermon, we will sit in the pew, heads tilted toward one another. I thought about the longevity of a good marriage. Ed won’t stay married to me because I’m beautiful (although like a good husband he tells me I’m pretty, especially when I’m mad at him!) I’m not going to stay married to him because he’s handsome. (He is very handsome, you know!) But there’s much more that will keep us together. When you are out with your girlfriends, don’t you think they are so beautiful? I do, and it’s not just the wine talking! My aunt said what all of us think. She is in her 70’s, and a very healthy, no-nonsense type of woman. She told me once that in her head she still pictures herself as young and thin, and then when she looks in the mirror she’s shocked at the old woman she’s become. We adore her, and when I think of her I think of the way she laughs. I love spending time with her. Is she the image of beauty? She would say no, but the rest of us would disagree. You already know what I’m getting at; beauty comes from within. Just like my girls love to put on sparkly clothes, however, I’ll always love my sparkly eyeshadow. I think I’ll go put some on right now. Join Gretchen from Second Blooming and me this week as we write about beauty! Link up your post below! We’re looking forward to reading what you have to say! 4 Responses to Am I too old for glittery eyeshadow? What a great post Ginny Marie! I have to admit I am feeling like your Aunt when I look in the mirror. I even wrote a poem about it a few years ago. I am finding that I am liking my look in the mirror more and more without all the makeup but I will never go without my eye shadow, liner, mascara and lipstick!!! 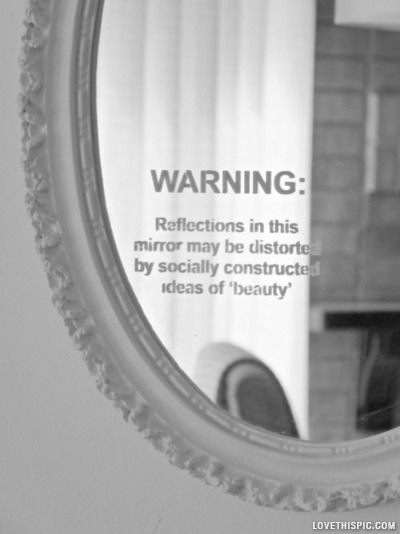 I had to borrow that mirror picture to print it out for our daughter who suffers with Body Dysmorphid Disorder. How lovely that you have a husband and two children who will tell you how beautiful you are! As for me, I’m going to put on some sparkly eyeshadow. Angelina Costenaro recently posted…Beauty and the Beer??? I think you’re right about beauty coming from within. My grandmother will be 100 on Monday. She’s still beautiful. I wonder what she sees in the mirror. A very, very old woman? A crazy, rebellious 20-something? I hope a little of both, really. tamaralikecamera recently posted…PinkWhen Jen and I! It’s interesting, Jude says the same thing to me. That he likes me better without makeup. He says the same thing about his teacher, who he adores. Clearly, society has taught us to see ourselves through less pure eyes than children. However…I say go for the sparkly eyeshadow! I’ve been kind of into black eyeliner lately. I like to think it’s hip. Hmmm. And isn’t it a blessing to have husbands who think we’re beautiful no matter what?